Summary: The final day of the walk begins by leaving Kettlewell and climbing up to magnificent limestone pavements which are to be enjoyed all the way to Grassington. 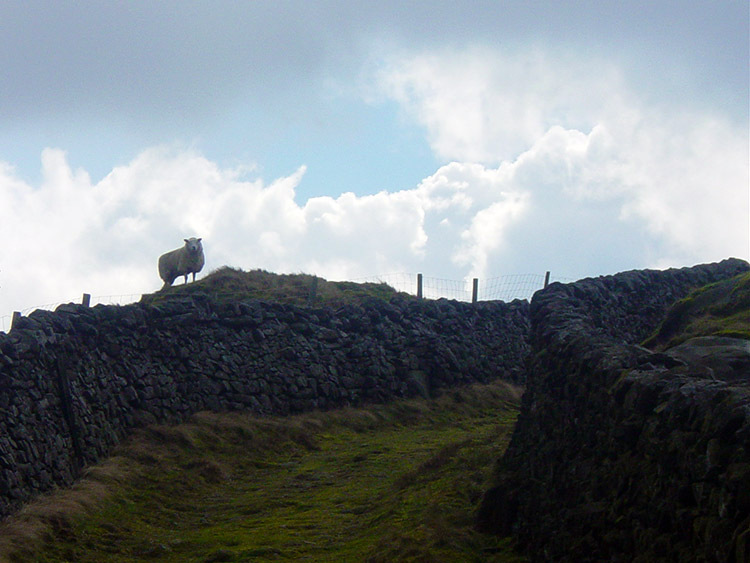 This is part of the Dales Way Footpath. From Grassington the walk continues on the Dales Way to Linton Bridge. From Linton Bridge the walk heads off to Thorpe an then to its final high plateau. This is Embsay Moor. 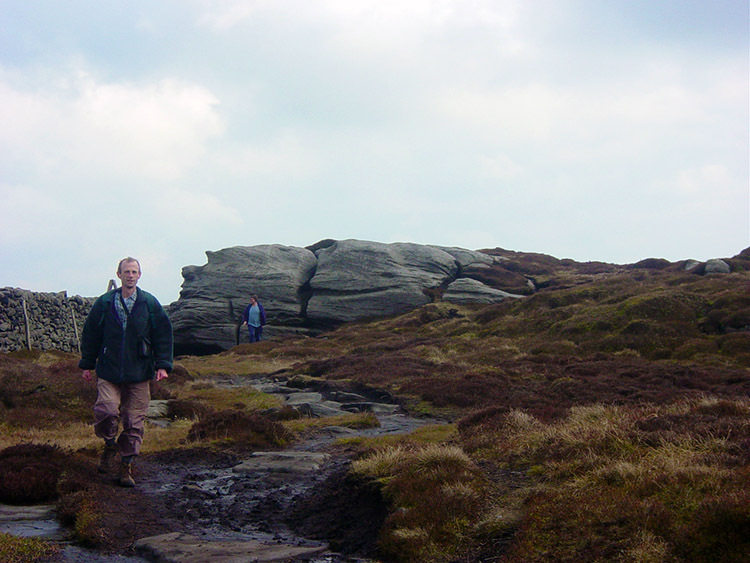 The walk follows the fringe of the moor to Cracoe War Memorial and then to Rylstone Cross. From the cross the walk continues to Embsay Reservoir and then through the village before heading towards Skipton Woods. 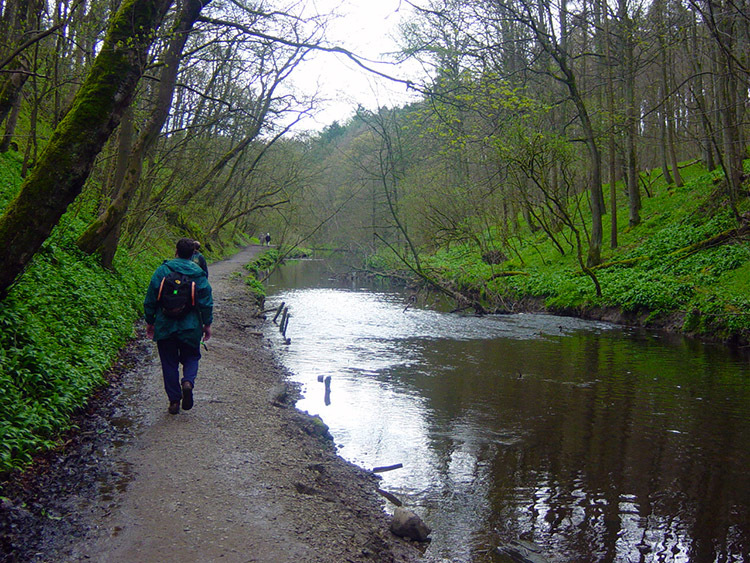 The walk makes it's course through the woods to Skipton Castle and that is where it all began. Well done, the walk is completed. (Note: The map and downloadable .gpx file show the recommended route from Embsay to Skipton and not our route through Skipton Woods. Whichever way you go the choice is yours). The Walk: It was still overcast and drizzling as Steve and I set off from Kettlewell (after yesterdays awful weather) but there was no way the rain could dampen my spirits now. As we walked off through the village I considered 'We have walked 120 miles in seven days in some of the best Yorkshire Dales scenery and now there is only today and 17 miles left to do. I planned this walk some months ago and so far all my expectations have been realised. Steve and I have covered the lot without hardly ever having to resort to following a road. My planning had proved to be better than I had imagined and if today goes to plan then I have created a credible long distance walk' My spirits were high. And the sun was forecast to come out pretty soon anyway. We were still following the Dales Way for a good part of today, as we had from Buckden yesterday, as we made our way up from the road onto the limestone pavements which are prominent between Kettlewell and Grassington. It was not long after we had climbed up onto the pavements on Highgate Leys Lane when the sun started to peep through. I was to be accompanied by fair weather on the final stage of this truly superb walk. Now I was feeling pretty darn good. As we set of heading due south to Grassington my only regret was the expected departure of Steve. My best walking mate had to get back to Somerset this evening and considered leaving at Embsay, about 3 miles short of the finish at Skipton Castle. He did not say it but he was dreading the drive home after a long walk and I suspected he would leave at Grassington. (In Grassington Dave and Stewart would be joining me for the final walk into Skipton. Lil would be there with the car. It made sense he would leave then. However he kept saying he would leave at Embsay) The walk along the limestone pavements between Kettlewell and Grassington is super. 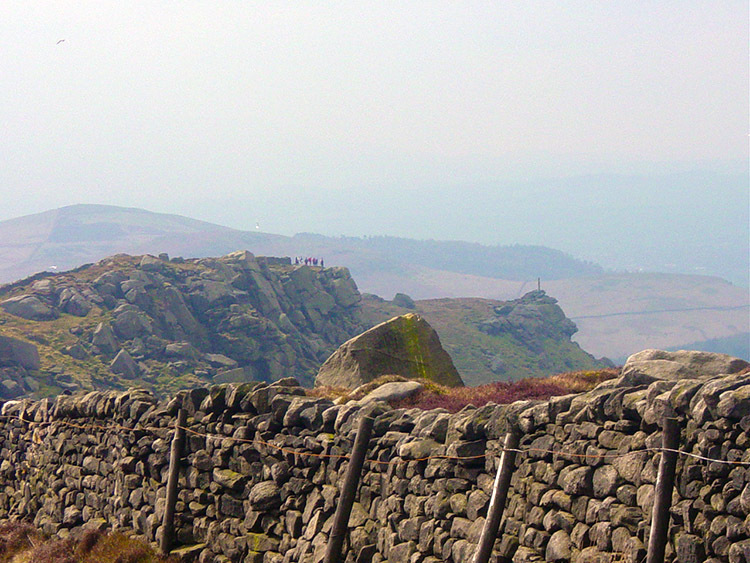 The walking is never difficult as the entire length at 5 miles is on the Swineber Scar ridge which is always near 300 metres high. With no ascents and descents a brisk pace can be maintained. As we had planned to meet with Dave and Stewart at 11.00am (we had set off a 9.00am) we kept maintaining the brisk pace which was required. There are couple of significant landmarks to gauge progress on the section. The first target, High Hill Castle was passed at about the right time. Then for a short time I lost my companion who deviated to make some field observations! 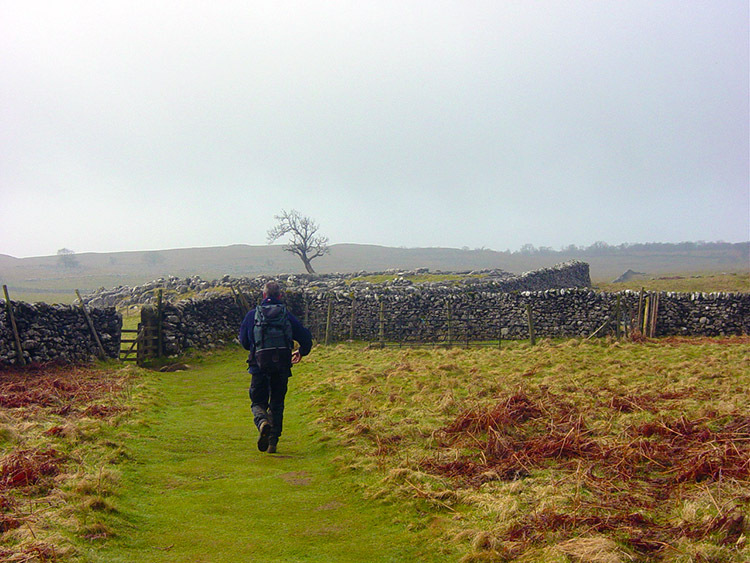 I walked on crossing over Scot Gate Lane which marked just short of half distance to Grassington at around 9.50am. The pace we had set was perfect. The sun was starting to beam down now and I walked on (still alone) towards the second of the two landmarks, a well preserved Lime Kiln. Just as I spotted the Kiln in the foreground I also looked back and spotted Steve making his way on the track after completing his field observations. I reached the Lime Kiln and took time out to read a plaque. It read 'The Lime Kiln was built around 150 years ago. 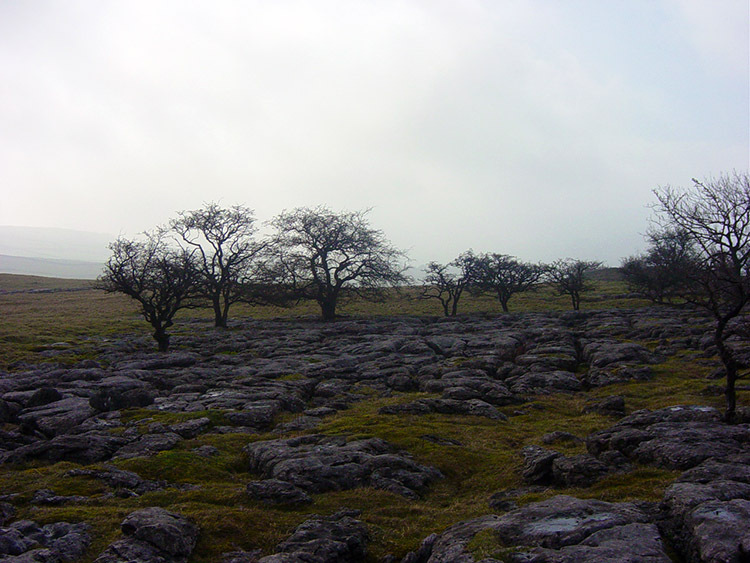 Locally quarried limestone was burned in it to produce lime. Farmers used to spread lime on the land to improve the grass'. It then went on to give a detailed account of how the process went. After reading it Steve reached me. After he had also read about the Lime Kiln we headed off to continue our walk on the pavements. We passed lovely examples of them, some of them supporting a lonely tree that refuses to give in. These solitary trees are always evidence of the direction of the prevailing wind as they naturally lean away from it. Soon we started to reach the end of the ridge and Grassington came into view. I was looking forward to seeing Dave and Stewart. I was especially looking forward to seeing Lil. I was not looking forward to saying goodbye to Steve. I expected I was going to be very soon. We reached Grassington. We walked into Grassington from above and descended down the main street. As we walked down we spotted Dave, Stewart and Lil at the bottom. We walked to them and as soon as we arrived Steve said "That's been a brilliant walk Mike. Thank's for planning it" He added "I am going to leave here. I have still got to get back to your house and then drive to Somerset. If I don't go now I'll be driving at night". I was not in the least surprised he had decided to leave here. I knew he would. Nevertheless it was a great shame to be saying goodbye to Steve before the conclusion of the walk. He was the best of walking partners. A top guy. I went to talk to Lil while Steve chatted with Dave and Stewart. He was very apologetic for having to leave just as they were joining me for the last stage. Dave and Stewart understood. We all understood. I would not have been looking forward to such a long drive either after the brilliant week we had just enjoyed. (Incidentally I will not be mentioning the Broadband issue here. I am saving that for the book! As I am with the evening activities and a few other gems) We did not linger in Grassington, just long enough for Steve to have a chat to the boys. I was looking forward to the final stage of the walk but I was also looking forward to a long hot soak in my own bath. I had only had two baths to relax in during the eight days. I had to be content with a shower on the other six occasions. So now Steve was gone (thanks for the company, the chat, yarns, drinks, etc. 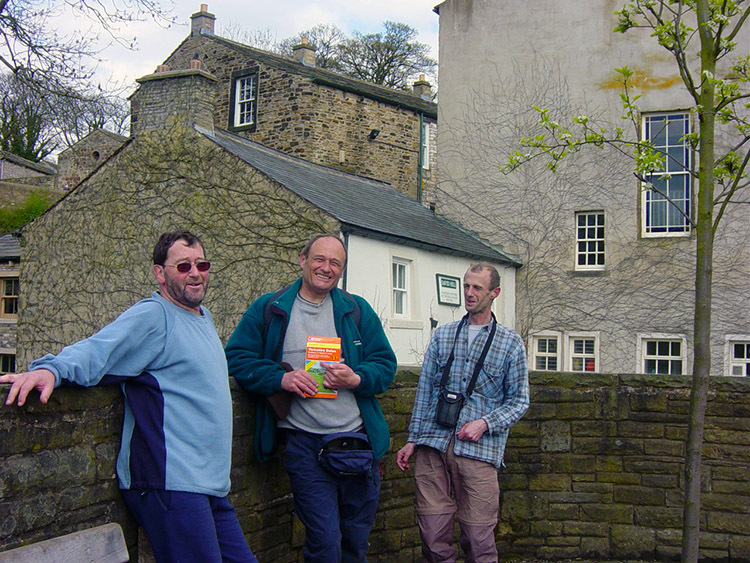 Thanks for everything) and I walked out of Grassington in the pleasurable company of Dave and Stewart. I was certain I was going to get some more stimulating stories from the two of them. 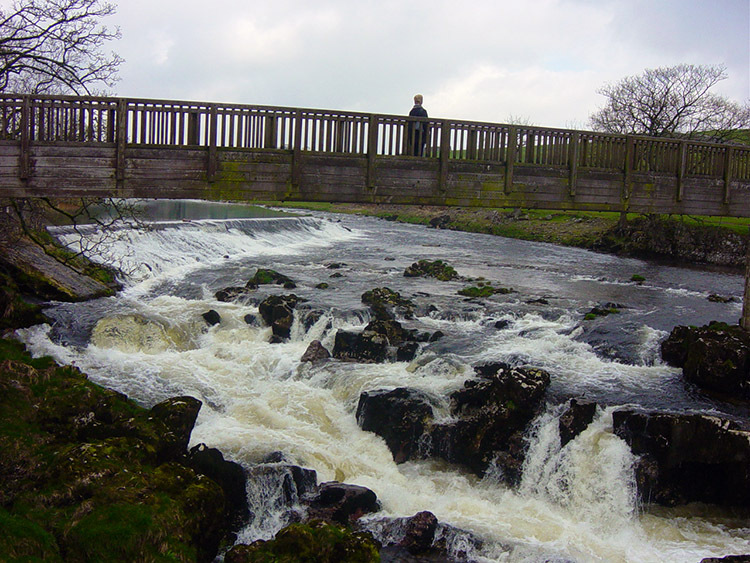 The final stage took us out of Grassington to the River Wharfe at Linton Falls. The series of small waterfalls is a popular Dales visitor attraction and after the rain of yesterday they were providing a good flowing show. We looked on them for a while and then left to make our way to Embsay Moor via Thorpe. As we were leaving the waterside we spotted some ducklings "Blooming heck, that's early for little ducks to be about" said Stewart. I agreed it seemed early in the year but I am no expert on Duck breeding. We started to climb into Thorpe soon after leaving Linton Falls. We were not sure we had ever been to Thorpe before but as we arrived in the village Dave said "Yes I have been here before. I once walked through here with Jez. At least I think it was Jez. Then it could have been someone else" Whoever he had been with he was sure he had been before. The village was very sleepy and the only company we made was that of a black Labrador which was sat quietly on a quad bike. It was a humorous meeting. After that we made our way through the village and started a short steep climb up a bridleway that would take us up onto Embsay Moor. Half way up we stopped for a rest and a drink. The climb had warmed us up. As we rested Stewart told us "My fingers have swelled up already. I couldn't get my ring off now if I tried" Stewart likes a drink or two and had some last night. The finger swelling is a result of his love of the ale. Good job I don't wear a ring. After finding out all the facts on Stewart's digits we set off to complete our ascent onto the moor. At first it was tough going as we steeply climbed following Hesker Gill up to its source. After the gill we tracked over heather to meet a track. Dave said "Are you sure you're going the right way". "Trust my bearings" I replied. We were soon on the track. We then followed the track firstly past Bartle Crag and then past Peter's Crag towards our next target, the Cracoe Memorial. The walk over the moor was pleasant but the best was yet to come. There was another spectacular section of my walk still ahead of us. We continued walking to the memorial. We had seen it for a while now but it seemed a long time reaching it. Eventually the track faded away and we followed a wall for the last half mile to the memorial. Finally we arrived. 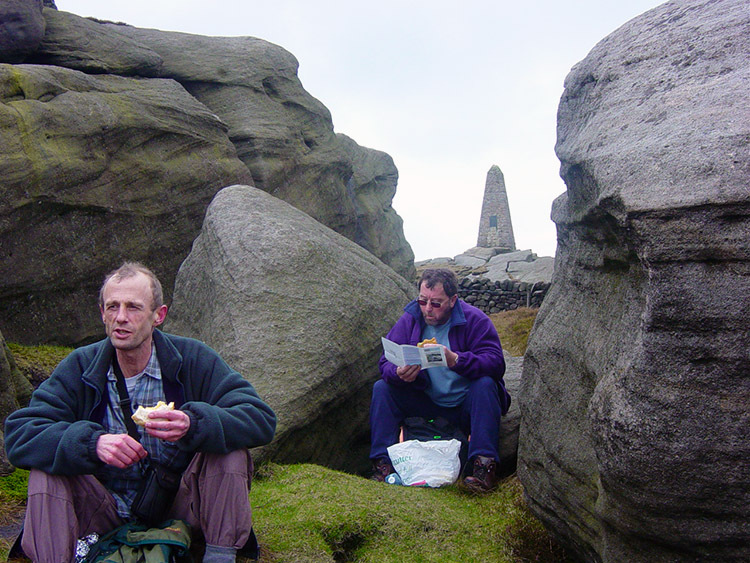 The sun was warming as we sheltered in a windbreak section of a gritstone outcrop and stopped for lunch. It was a lovely setting for the last lunch of the walk. On completing the final lunch of the walk we began a glorious walk on the edge of Embsay Moor. The walk took us from Cracoe Memorial to Rylstone Cross. This one mile section provides fantastic views of the Yorkshire Dales to the west. I looked out to spot Flasby Fell where Steve, Chris and I had been one week earlier. It is a memorable mile to walk. From the cross we then continued to follow the edge of the moor to Waterfall Gill. This is another little jewel and I crossed over the gill near the waterfall with some poignancy. I was about to leave my treasured Dales. After Waterfall Gill we rounded Hellifield Crag. As we did so the clouds rolled over and a rainstorm began. Were we to have a wet finale? We tracked up out of the rainstorm to shelter at the side of Crookrise Wood. As we did so the wood seemed to be steaming. Was there a controlled fire in the wood or was it condensation rising. Condensation should abate during a rainstorm yet we could not smell any burning. It was strange and we never did work it out. The rain soon stopped and we forgot about it. We tracked along the wood to High Edge. Here Embsay Reservoir came into view with Skipton to the right. The end of the walk was now in sight. 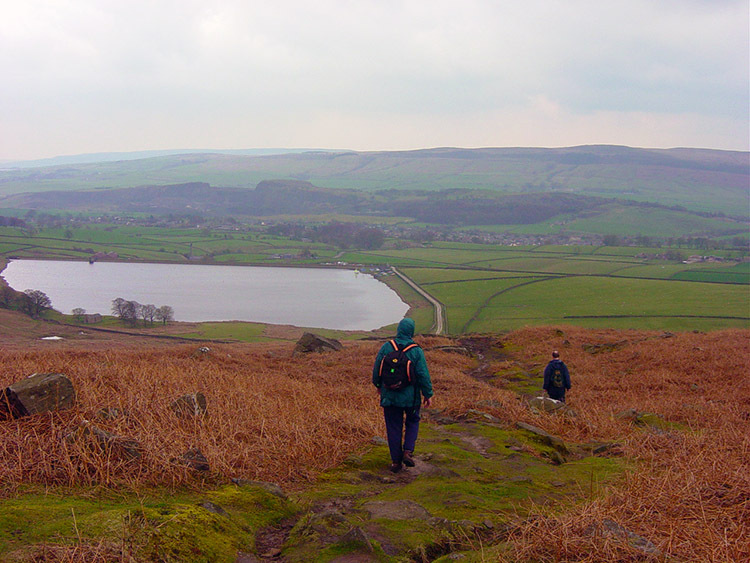 We made a steep descent off the moor to the reservoir and then passed round it to meet the road into Embsay. The sun was back in control as we walked through Embsay village. Our walk was interrupted at the village pond by the randy antics of half a dozen drakes harassing a single female duck. So the ducklings at Linton Falls were early. After observing the fracas we followed tracks through Embsay to Skipton before scaling a road bank which gave us access to Skipton Woods. (I must sort the path out here) The improvisation took us into Skipton Woods allowing the walk to conclude by walking the full length of the woods. It was a fitting climax. Wild Garlic was abundant, the smell so refreshing after the rainfall. Wood Anemone added super colour. What a finale. We walked out of the wood triumphantly past Skipton Castle and emerged onto the street at the exact spot I had left from a week ago. I was exhilarated on completing a fantastic long distance walk. It proved to be a fitting celebration of the Yorkshire Dales. Every day had it's highlights. Every day was brilliant. To Steve, Chris, Dave, Stewart and Lil. Thank you for making the inaugural walk of my Yorkshire Dales Celebration Way an unforgettable experience. I appreciate the company and help you provided in making the whole experience so special. Until the next time.